Our wide heat Silicone Heaters give you the ability to heat thermoplastic material up to 6" wide. Ideal for material up to 1½" thick or thin material that requires a wide radius. The flexibility of the Silicone Heaters is ideal for heating rod or tubing. Simply bend or wrap the heater to fit your material. Silicone Heaters may be used with our power controller allowing you to fine tune the working temperature to your exact needs. These heaters are 5 watts per square inch to a maximum surface temperature of 475°. 1" x 29" 2" x 29" 4" x 29" 6" x 29" 1" x 41" 2" x 41" 1" x 53" 2" x 53" 4" x 53" 6" x 53" 1" x 101" 1" x 125"
This robust power controller uses a digital microprocessor for overload protection. If the controller senses an overload, it will automatically limit the current flow to 15 amps and warn you with the indicator light. This unit also has a low voltage indicator light that tells you if your supply voltage drops below 100 volts. Comes with an anodized aluminum housing and internal cooling fan. 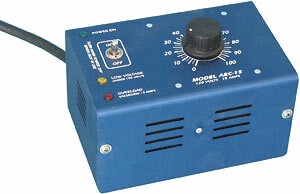 The AEC-15 can also be used for some hot wire applications. 6" x 15" x ½"- Designed to work with all 4 sizes of Silicone Strip Heaters. Place end to end under Silicone Strip Heater. Model 4003 Insulation 1-4 pcs $34 each.